Enjoy an amazing 15-20minute tubing session on Biscayne Bay. Skim through the water at high speeds! 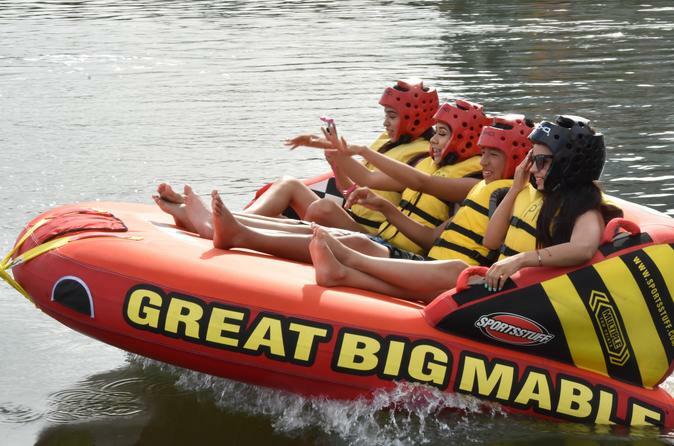 Its really is a thrilling ride for the whole family, Our tube can fit up to 4 riders at a time, having the other riders waiting for their turn on our Rib Craft boat which will be towing the tube. Come Over to Miami Watersports, where our professional team will get you geared and help you board on our inflatable tube. You will be getting towed at rushing speeds by our 25ft powerful Rib Craft boat. As you hold on tight, don' t forget to look at the breathtaking view of Downtown Miami, Miami Beach, Key Biscayne, and many more unique places in hidden in the heart of Miami! On the way back to the departure point, don't forget to ask your captain about the other activities that we offer here at Miami Watersports such as Parasailing; Jet Ski; Flyboarding and many more!